In this recipe for candy cane truffles, crunchy candy cane bits coat a smooth, minty, ultra-dark chocolate ganache. The result is an indulgent Christmas candy perfect for the holidays. Starlight mints can also be used if you are making these at a time when candy canes are not available. Beware that the candy cane pieces tend to get sticky if left out in humid environments (like a refrigerator! ), so be sure to keep these well covered and serve them soon after making them. Finely chop the semi-sweet chocolate, and place it in a heatproof bowl. Unwrap the candy canes, and place them in a food processor. Pulse on/off several times for 5-10 seconds each, until the canes have been crushed into small pieces. Heat the cream in a small saucepan until it is almost boiling and bubbles appear around the edges. Pour the scalded cream over the chopped chocolate, and allow it to sit and warm the chocolate for about a minute. Using a spatula or whisk, stir the chocolate and cream together. Stir until smooth and incorporated. Add the mint extract and the butter, and continue stirring until the butter melts completely and your ganache is silky smooth. Add most of the crushed candy canes, reserving several tablespoons to use as decorating. Stir until the crushed candy is well-distributed in the ganache. Cover the top of the ganache with cling wrap, and place it in the refrigerator until it is firm enough to scoop, about 2 hours. If it is left longer it may be very hard to work with, so you might have to let it soften at room temperature if this is the case. To form the truffles, use a teaspoon or candy scoop to scoop uniform amounts of ganache then roll the balls between your palms to get them round. Place truffles on a foil-lined baking sheet and put the sheet back in the refrigerator while you prepare the chocolate coating. Place the candy coating in a microwave-safe bowl, and microwave until smooth and melted, stirring after every 45 seconds to prevent overheating. Once the coating is ready, use a fork or dipping tools to dip the truffles in the coating one at a time, dragging the bottom against the lip of the bowl to remove excess coating. Place the truffles back on the foil-lined sheet, and while the chocolate is still wet, sprinkle the tops with the reserved crushed candy canes. Repeat with remaining truffles and coating. Once all of the truffles are dipped, return the tray to the refrigerator to set the chocolate for 15 minutes. 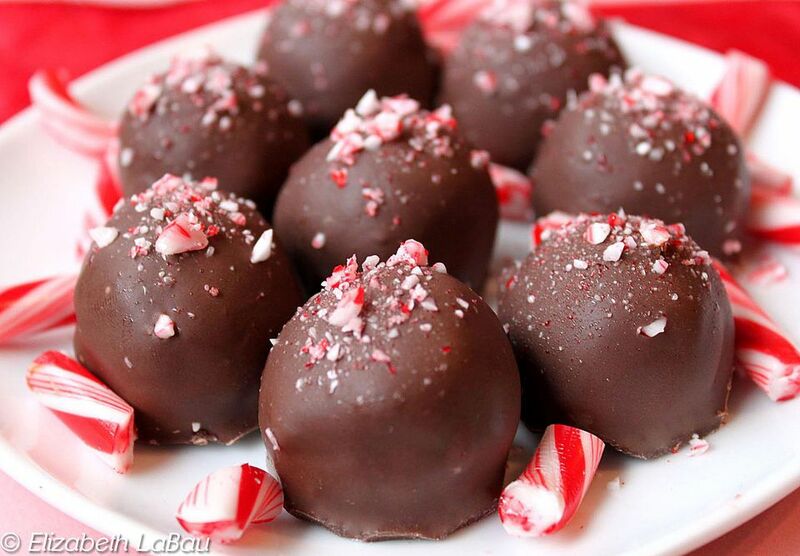 Store candy cane truffles in an airtight container in the refrigerator for up to 1 week. Allow them to come to room temperature before serving for best taste and texture. If you don't have a food processor, place the candy canes in a large Ziploc bag, and seal tightly. Use a rolling pin to roll/smash the candy canes until they are crushed into small pieces. Fresh Mint Truffles - Made with Real Mint!